The Civil Guard of the Region of Murcia and the Local Police of Caravaca de la Cruz have arrested a juvenile, as an alleged perpetrator of a crime of drug trafficking. They have been seized 23 grams of marijuana and 70 euros in fractional currency. The intervention was carried out last Saturday, day 11, when agents of the Local Police of Caravaca de la Cruz, who were serving in the municipality, observed the presence of a group of young people, one of whom showed some nervousness when they noticed the police presence. 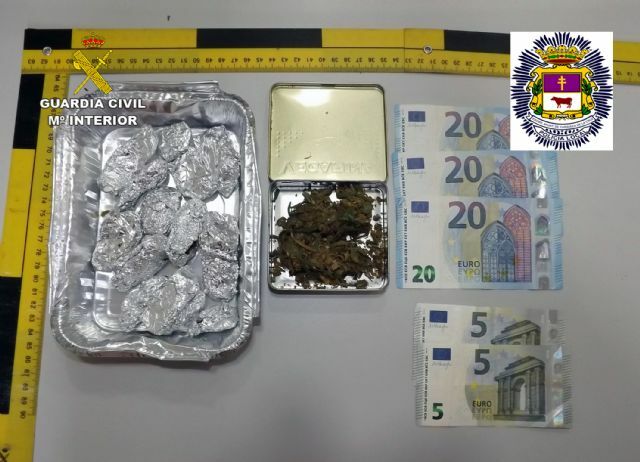 The identification of these people allowed to locate, among the belongings of one of the boys, 13 aluminum foil wrappers containing narcotic substances (cannabis sativa), a metal pack with other marijuana buds, as well as a total of 70 euros arranged in fractional coins, all of which was seized. This finding made us suspect that the young man was in the area with the supposed intention of distributing the drug at retail among regular consumers of the municipality, so the Civil Guard proceeded to his arrest as an alleged perpetrator of drug trafficking. The result of the action was settled with the seizure of 22.8 grams of cannabis sativa and 70 euros in fractional currency. The arrested, the drug and the money intervened, as well as the educated diligences have been put at the disposition of the Public Prosecutor for Minors and the Juvenile Court of Murcia.